Does your pet suffer from joint problems? 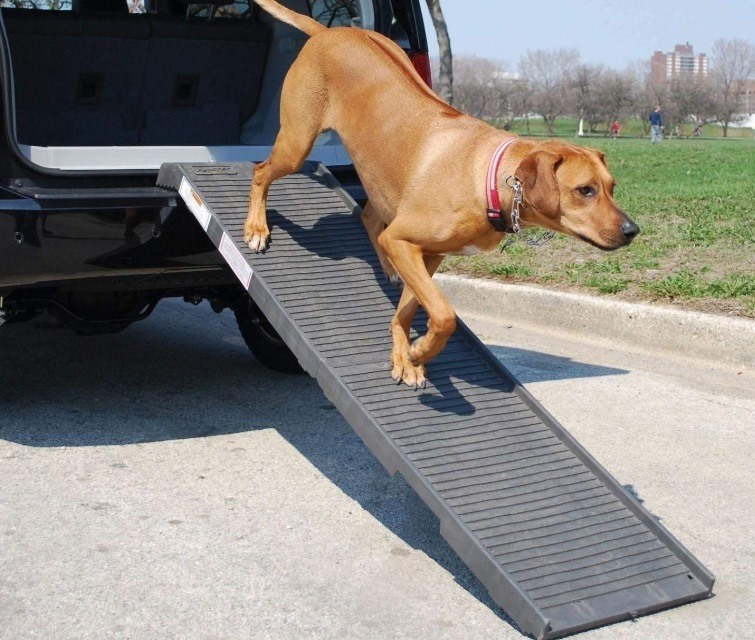 Pet ramps can significantly alleviate the pain on your buddy’s legs if they are struggling to get in and out of the car or getting onto furniture. They’re also a great preventative for older or middle-aged dogs since dog ramps can help prevent strain on the joints. Pet ramps are light enough and portable so they can be used for both home and your car. Investing in a pet ramp now can save you a small fortune in vet’s bills in addition to adding a little comfort to your pup’s life. If even the smallest of steps is a huge challenge for your dog’s arthritis or wish to help prevent injuries like IVDD (Inter-Vertebral Disk Disease) - a dog ramp can make both yours and your pup’s life so much easier. According to PetMD.com, IVDD occurs when a disc in your dog’s spine is either ruptured or herniated, leaking its contents and causing inflammation and severe pain for your pet. Just like with humans, as dogs age, their discs degenerate over time resulting in a herniated or ruptured disc. This makes getting in and out of vehicles especially those with a higher ground clearance quite a challenge for your dog and run the risk of further injuries. Osteoarthritis can also contribute to IVDD in dogs. Does your furry friend snuggle with you on the couch? Trauma like falling when leaping onto furniture can also cause a dog's disc to rupture. 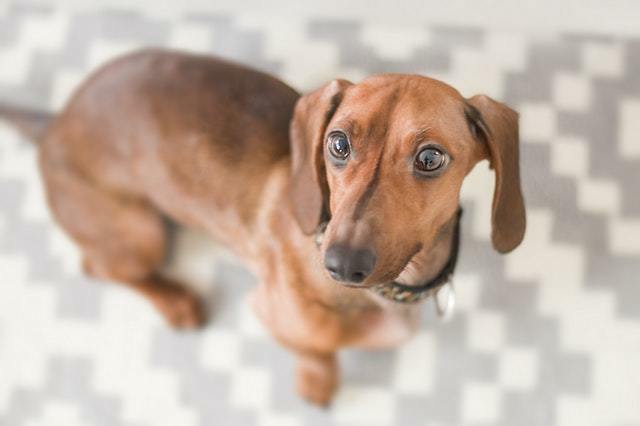 Due to the long stature of some dogs, the low cervical, mid-thoracic and lower lumbar spine areas of the body are under major stress when jumping on and off furniture, making these pets more susceptible to IVDD and other joints problems. Did you know that 1 in 4 Dachshunds are now affected by IVDD? Chondrodystrophic breeds, i.e. dogs with long back and short legs are most prone to developing IVDD. These include: Dachshunds, Beagles, Corgi, Cocker Spaniels, Poodle, Bassett Hound, Bulldogs, Pekingese and Shih-Tzus. Certain large breed of dogs that are also affected by this disc disease and hip dysplasia include Labrador Retrievers, German Shepherds and Doberman Pinschers. Finally, obesity is another contributing factor to developing IVDD. Diet is something that owners can easily rectify so as to reduce a dog's risk of IVDD. Vets recommend dogs eat a diet that is moderate in fat and complex carbs and relatively high in quality protein. This type of diet is what helps build muscle mass and prevents the risk of your dog getting overweight. IVDD is a heartbreaking condition. Pet and dog ramps are crucial non-invasive treatments and preventative aids to help reduce the pressure on the discs between the vertebrae in the spine reducing the risk of this inherent back problem in dogs. Make traveling easier when you help your furry friend climb into the car. For this review, we've scoured the web for the absolute best ramps for your vehicle based on a number of criteria: weight, traction, portability, assembly, dimensions and other pet owner's feedback. Below are reviews of the overall winners. • Ramp Weight: 10 lbs. • Maximum supporting weight: 150 lbs. • Vehicle suitability: SUV's, Cars and Trucks. This dog ramp is lightweight but incredibly durable. One feature that stands out with this ramp is the ability to fold in half. This allows secure storage and transportation hence suitable for outdoor use. The top surface has high traction which ensures the dog climbs up and down safely. The textured surface similar to sandpaper ensures the dog does not slip or slide even when it gets wet. This feature also comes in handy for older dogs or those with mobility issues. The ramp being made of hard-wearing plastic means you can leave the ramp outdoors without worries of corrosion or rust. The ramp has indention beneath the railing which helps when carrying it around. Also, it has a safety release latch which helps to prevent accidents when opening. These features come in handy when you need to use the ramp regularly or have many dogs sharing the ramp. It doesn't have rubber feet, however the whole bottom side and lip that sits on the ground and on the bumper is all rubber, so the Solveit Ultralight bi-fold dog ramp is pretty sturdy and easy to move around. • Open dimensions: 72" L x 16" W x 1.5" H.
• Ramp Weight: 17 lbs. • Maximum supporting weight: 250 lbs. • Vehicle suitability: Jeeps, Cars, some Trucks and Minivans. This dog ramp is easy to navigate for your pup, is foldable and easy to transport. It has a comfortable feel with the poly-grass to allow your pet to get an excellent grip going up and down. The surface acts like natural grass and prevents scratching the dog's paws as it tries to grip. The short dense artificial grass is smooth and will not scratch up the interior of your car nor will it be spiky for your dog's paws. It is easy to carry around, and the design allows easy storage. The ramp folds up by half saving storage space. Also, the ramp has a soft rubber handle for easy carrying and rubber feet on both ends. One feature that stands out with this ramp is the locking latch that ensures it does not unfold accidentally when in use. As much as this ramp opens up to 72 inches long, it is thin and compact when in store. It fits well in the back of the car without worrying about taking too much space. The Gen7Pets Natural Step Ramp is a great dog ramp for a 4x4 or car, it's well built, textured for grip and is portable. • Open dimensions: 71" L x 16" W x 4" H.
• Ramp Weight: 15 lbs. • Maximum supporting weight: 200 lbs. • Vehicle suitability: SUVs, cars and Minivans. One of the features that make this ramp unique is the tri-fold mechanism which is great if you're limited in storage space. It has ample walking surface and has a low gradient stepping surface which is essential for older dogs reducing the risk of slipping while climbing. 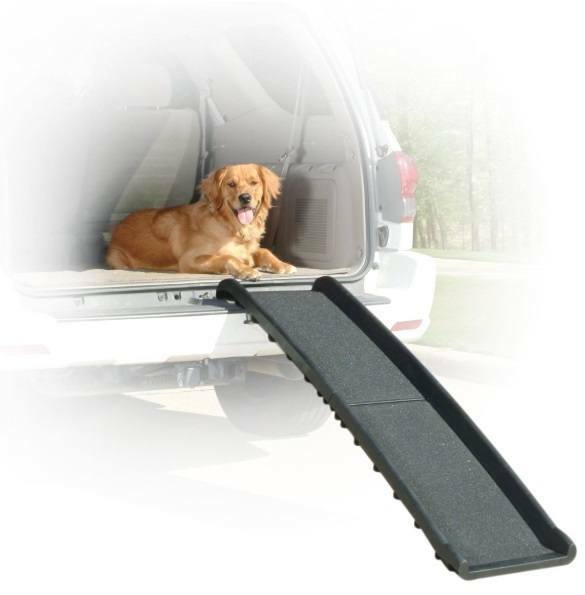 The pet ramp makes entering and exiting cars pain-free for dogs with mobility issues as well as puppies. Made with high-density, lightweight molded plastic, the ramp also features a built-in handle for easy portability. The ramp is fitted with rubber grippers at the bottom for stability. These help to keep the ramp steady and stable on the ground allowing the dog to get down comfortably. The Pet Gear Tri-Fold Pet Ramp is available in colors: Chocolate or Black/Yellow (with Reflective markings). The latter is a little pricier since the reflective markings provide that extra bit of safety to help guide your dog when climbing up or down. • Ramp Weight: 18.5 lbs. • Maximum supporting weight: 500 lbs. • Vehicle suitability: Cars, 4x4's, Trucks, Campervans, Boats. This sturdy dog ramp is suitable for wet, dry and snow conditions; thanks to its rubberized non-slip walking surface that is also rust-free. The traction surface is designed to ensure it is soft on your pet's paws while providing superior traction. It helps promote healthy joints by eliminating the repeated shock of jumping which can cause trauma to your dog's joints or spine. The ramp folds in half for easy portability. It has molded hands on both sides to carry comfortably and set up in seconds. It does not require any hardware to work since it comes fully assembled. The design allows the maximum functionality of the ramp. It features a 5-year warranty and comes highly recommended by other pet owners. This ramp has a sturdy construction to last long. It utilizes composite plastic which makes it ultra-strong and durable. Available in colors Khaki/Beige and Graphite/Gray, the PetSTEP Folding Pet Ramp gives you the freedom to bring your best friend with you everywhere you go. 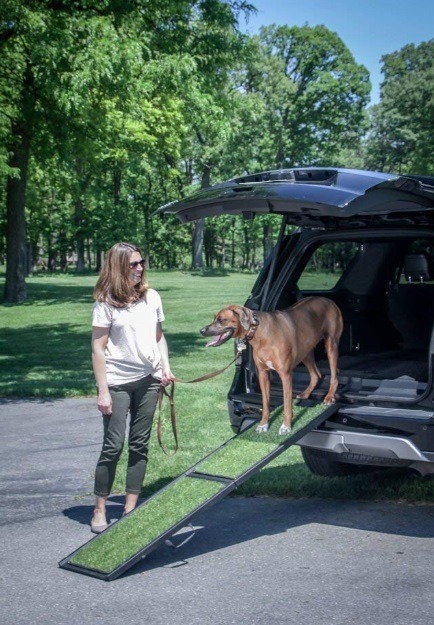 A dog ramp is a must-have item if your dog has arthritis or suffers from joint disease since it will help prevent further injury caused from the stress placed on the joints from jumping in and out of a vehicle. A lightweight ramp is a great and safe way to give your pet the access he/she needs to those hard-to-reach places while saving you the heavy lifting. 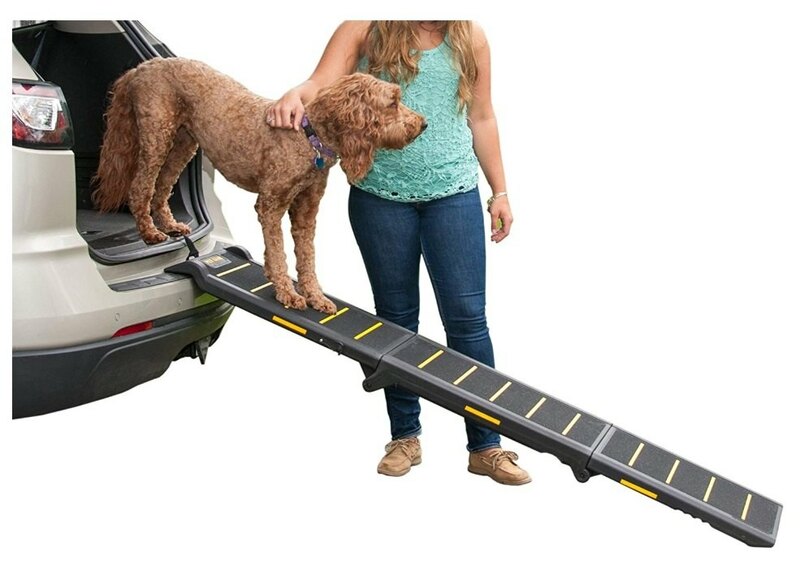 All of these are excellent products, but the PetSTEP Folding Dog Ramp is the overall best dog ramp for car, truck or SUV. It is sturdy, not overly heavy, has nice traction and folds up nicely....an excellent dog ramp all around, and the five year warranty is also a nice added bonus. This video shows the PetSTEP Original Folding Dog Ramp in action.